Riley won gold in the 50 back. 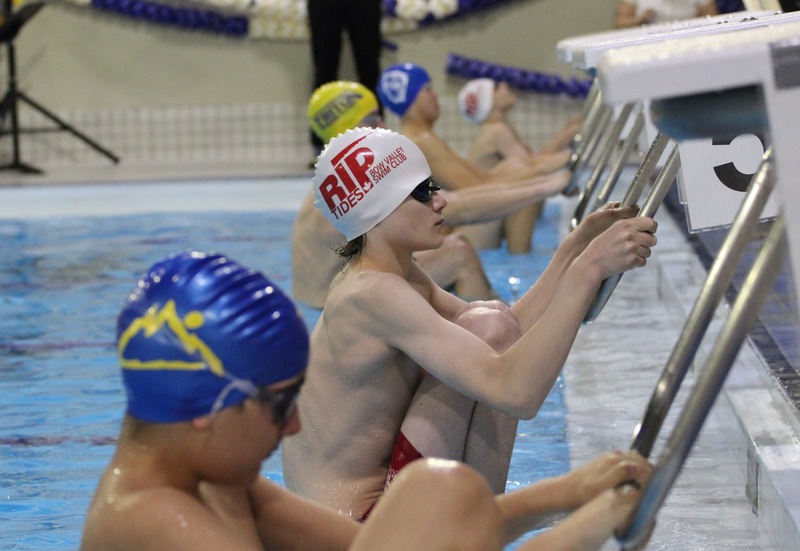 The NCSA meet in Airdrie last weekend was the last chance for swimmers to qualify for Alberta Age Group Trials and a final tune up for swimmers that have already qualified for Trials and Provincials. Neo led the club with 4 gold and 3 silver and combined with Riley, Pierre and Anthony for gold in the 200 free relay. He also finished 3rd in an exciting eliminator where the top 6 fastest swimmers in the 200 free faced off in a series of sprints (100-50-50-50-50) with the last place finisher in each race eliminated until there was a winner. Anthony swam 1:46.04 in the 100 breast to break Peter Brothers’ 2007 club record by a second. He also collected 2 gold, 3 silver and a bronze. Jaime led the girls with 1 gold, 2 silver and 2 bronze and took a second off her 200 free club record. Kiana – won 1 gold and 1 silver and qualified for Provincials with an A time in the 400 free. Shallis – a new B time in 200 back and 6 new PBs. Marin, Shallis, Kiana and Tanzin also combined for gold in the 11-12 girls 200 free relay. This entry was posted in Meet Results and tagged Alberta Age Group Trials, Medals, Records, Swim Meet by bowvalleyriptides. Bookmark the permalink.